52 Mantels: Art Party Details + DimplePrints Giveaway! 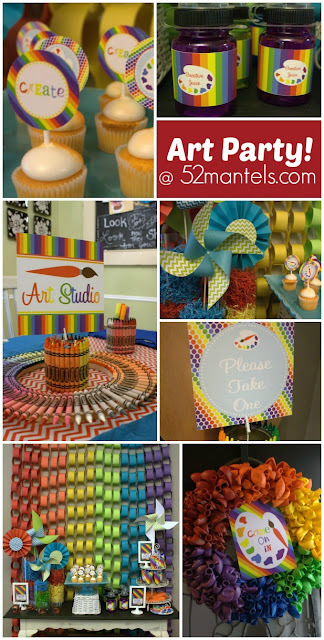 Art Party Details + DimplePrints Giveaway! 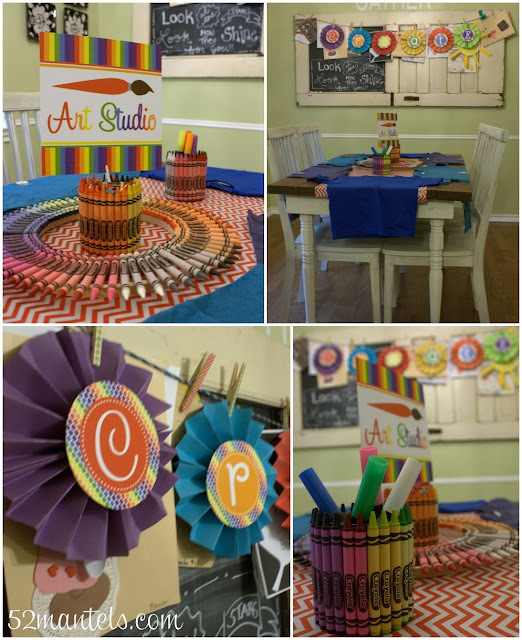 Last Friday, I hosted an Art Party for a few of my daughter's MOPS friends, using the cutest party printables from DimplePrints. 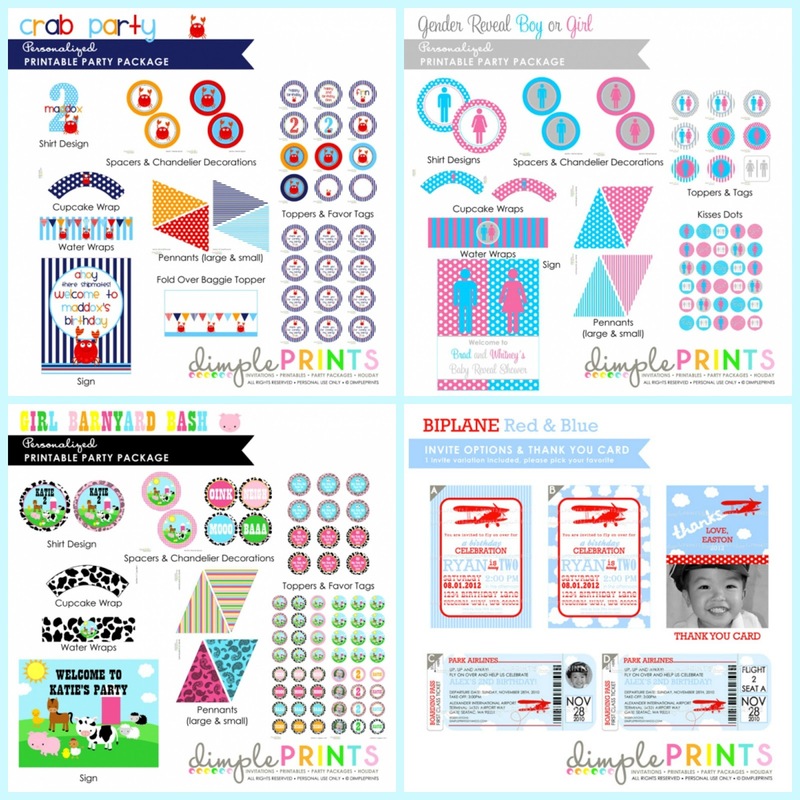 Carli, the talented designer at DimplePrints, sent me a deluxe party package to try out. I chose the art party theme and had SO much fun with it! AND, Carli is giving away one DELUXE party package to one of you guys! Winner gets to choose the package they like best. Awesome, huh? The details in the party packages are great! I seriously received over 100 pages of printables. I was in printable heaven! And, the instructions were clear and easy to follow. I love the cute fry boxes, don't you? Yes, even that was a printable. I simple cut it out, folded it according to the instructions and glued it together. Pretty straight-forward. 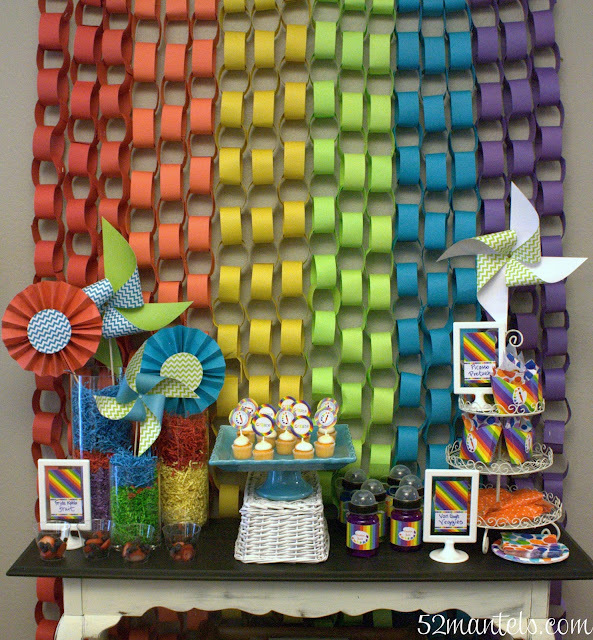 The paper pinwheels and construction paper chains were made by my sweet friend, Ashley, for another party. I love hand-me-down party decor! Here's a great tutorial for making a DIY balloon wreath. My same sweet friend made this one and I added one of the cute signs that came in my DimplePrint package! The kids were all in the 2-4 year range, so I kept the art simple. I grabbed t-shirts at Dollar Tree and fabric markers (made specifically for dark materials) from Hobby Lobby. The project was totally mess-free and easy for the littles! Are you admiring my crayon-wrapped tin cans? The tutorial for that can be found here. The "create" banner was one of several banner choices I received with my party package. I placed one circle on each accordion paper flower. Easy! The take-home gifts were art supply boxes with markers, safety scissors and colored pencils. Cute and really inexpensive! Lots of fun and colorful details, don't you think? I so enjoyed sampling this DimplePrints package! 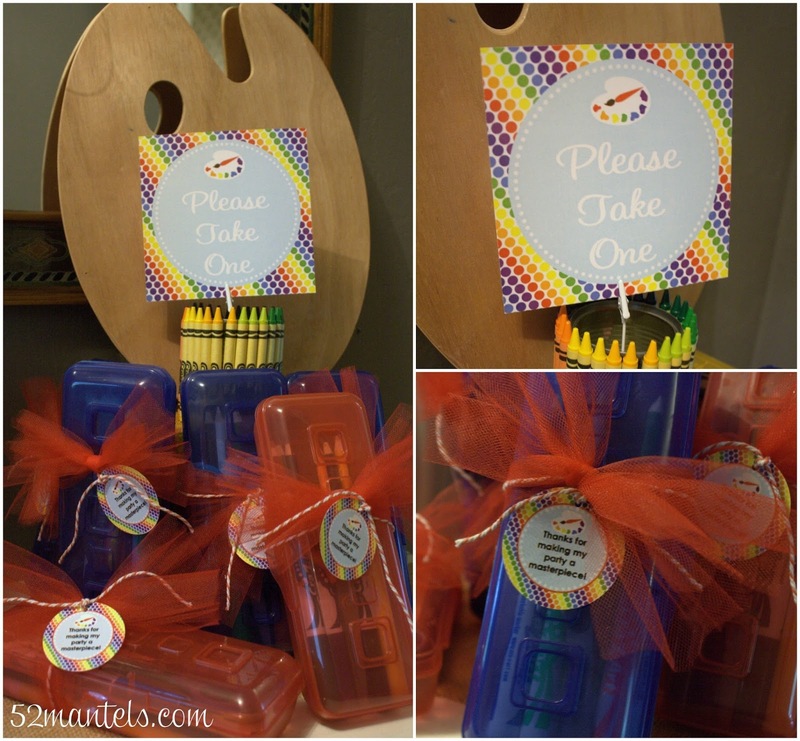 This party package was adorable! And, below are a few more of my favorite party packages from DimplePrints. But, it's really a hard choice, because Carli has pages and pages of CUTE parties!! SO...who wants to win a Deluxe Party Package of their own?? One winner will get to choose ANY of the $30 (completely customized!) party packages of their choosing! How fun is that?! **I received a party package from DimplePrints to review, but all opinions are 100% mine! What a fun party!! I love rainbow colors all together! It makes me happy! since we don't have any kids, we would love the "beer bash" package! I love the Tweet Little Birdie party! Perfect for my daughters upcoming 2nd birthday! I love the artist theme! My daughter would love it. So cute!! I love the wreath and the 'creative juice'!! I love the ice pop party. That sounds really fun on this hot summer day. 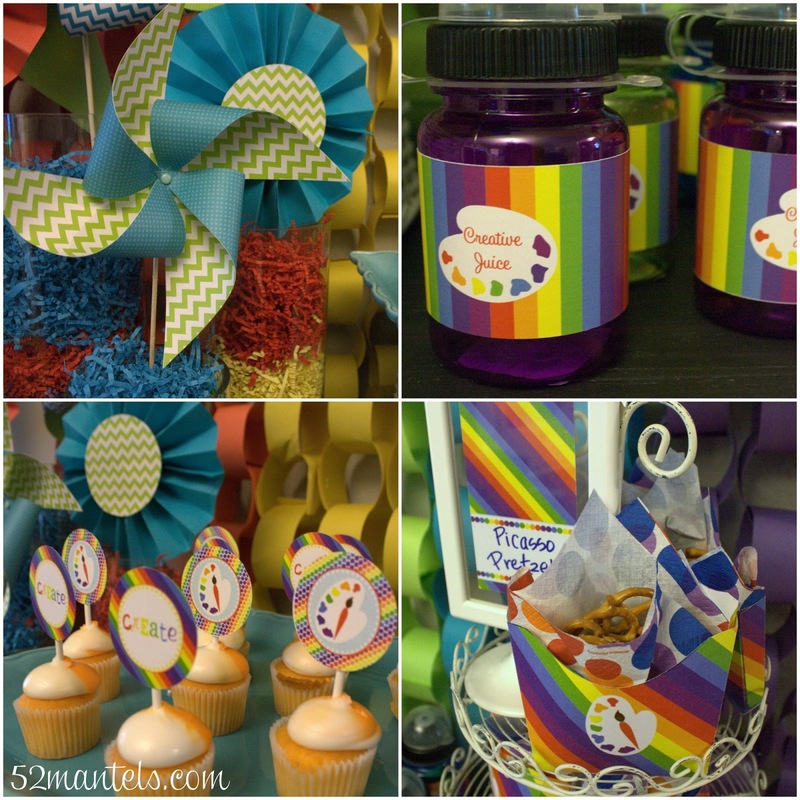 Oh I wish my children were little again so we could have a rainbow party! What a party! you must have spent hours cutting and folding printables!! How much ink did you use? Don't worry - it was totally worth it!! I love this party!! It's so bright and fun!! Love it!! I like the Gender Reveal package because I've always wanted to have one of those! I love the carnival party package! I love the train birthday party package. There are a lot of cute items! Great job! I love how you utilized the printables. What a fun giveaway! Thanks! LOVE your art party! The carnival package looks fun, too! Man so hard to decide! Either the little boy blue car set or the cars and trucks set.. My little guy's b-day is in November and I'd love to win this for it :) Great giveaway! My daughter would love the mermaid party package! I would choose the Gingerbread Party Package. The ice Cream Red & Blue Printable Party would be wonderful. So cute. I love the Elephant Package!! The Ice Pop Party is so cute and would be perfect for my daughter's summer birthday. I would choose the Little Man Deluxe Party Package! 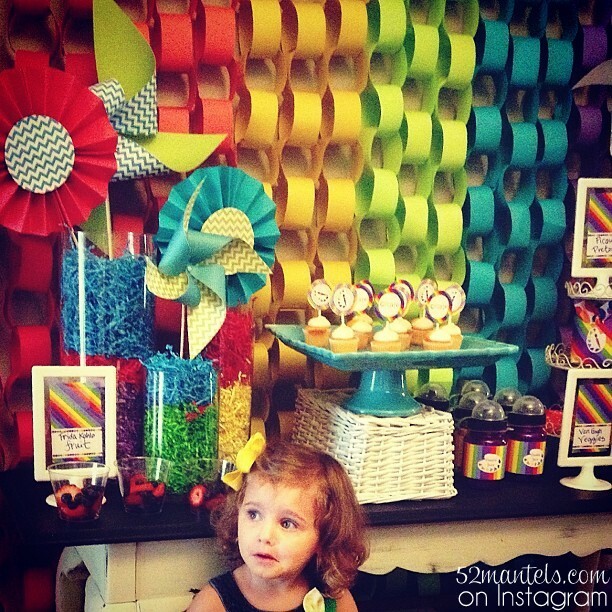 I really like the Candy Shoppe Deluxe Printable Party Package. It's my DD's birthday soon and she would love that. I'd love to get the Ice Cream Shoppe Girl Deluxe Party Package, my daughters birthday is in two weeks, this would be absolutely perfect! I would get the monster party theme!! I like the elephant chevron twins baby shower invites! I like the Christmas Gingerbread Party package. Love the Giraffe Party Package! 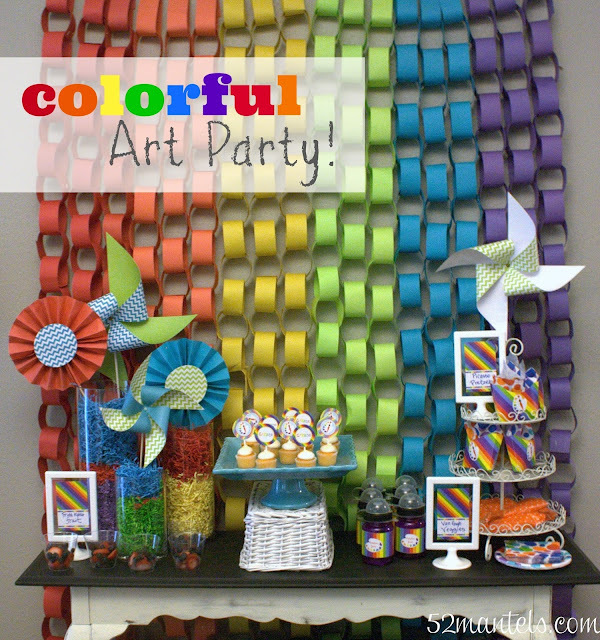 I love everything about your colorful party! 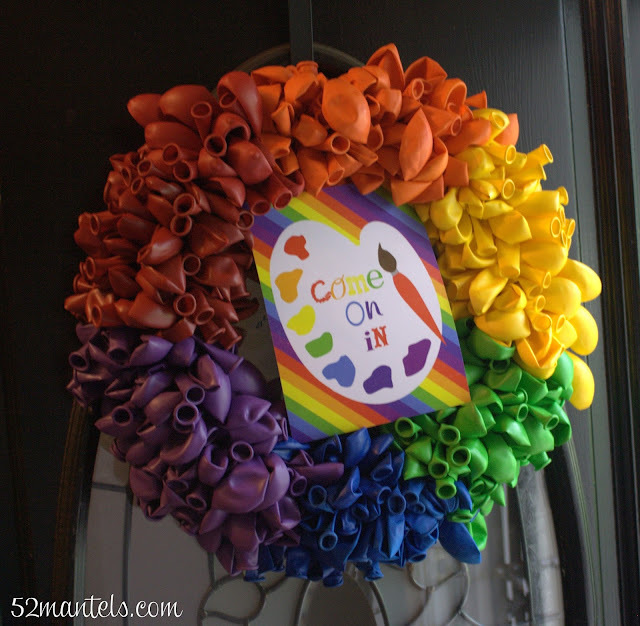 how did you hang your rainbow color paper chain? thanks!